Secondary bone cancer. Coloured profile magnetic resonance imaging (MRI) scan of a malignant (cancerous) tumour in the forth cervical (neck) vertebra (spinal bone) in a 49 year old patient. The brain is at top centre. 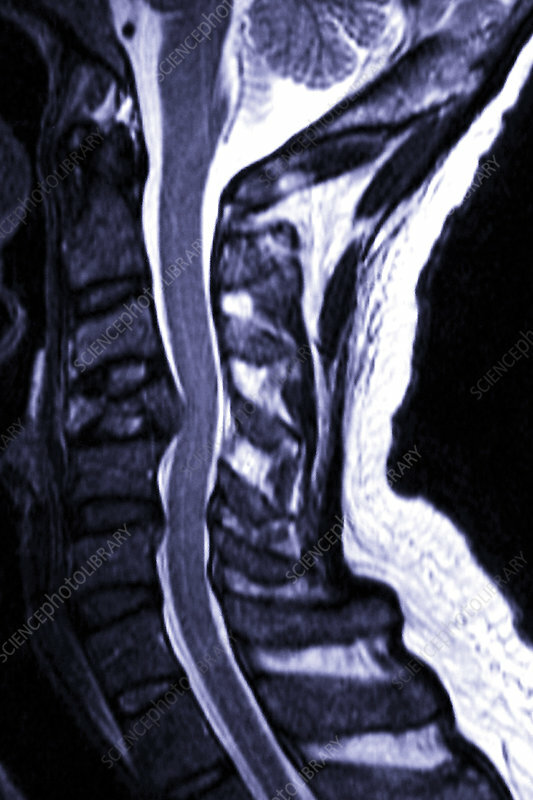 The tumour (centre left) is protruding into the spinal canal, the space surrounding the spinal cord (purple and white, running from top to bottom). This is secondary bone cancer, where the cancer has metastasised (spread) from the primary site, which was a thyroid cancer. Spread of cancer to bones causes great pain and the bones have a tendency to fracture. The prognosis is poor. Treatment is with radiotherapy and chemotherapy.